southern orders : WHAT GARBAGE! This morning I was looking through a book I've had for many years but had not opened in many years. In the inside cover of this book was a folded newsletter. I unfolded it and low and behold it was a newsletter from my former parish of St. Joseph in Macon, GA! The date on the newsletter was July 27, 1978. Guess what, I was a seminarian that summer and stationed at St. Joseph Church! I am in the newsletter as the summer seminarian with two pictures of me, stunningly young and good looking if I do say so myself. By I digress! You'll get a kick out of this! Under one of my photos is this caption: "Outdoor Mass was celebrated at 8 AM on the Fridays of July at the Holy Family outdoor shrine in our church yard. On several of these delightful occasions, Father Bob provided the music, Father Ben celebrated the Mass, and Allan McDonald preached. Following Mass, everyone enjoyed coffee and doughnuts and a little morning fellowship." As I recall, because I've lived it every July of my life, by 8 AM it was more than likely 90 degrees and humid. Can you imagine outdoor Masses in the sun in July in Macon, Georgia????? What were they thinking. Oh, I was not ordained and preaching at Mass, illicit no???? But this is the real time warp for you. Fr. Ben the newly ordained revolutionary priest in 1978 was in charge that summer because Fr. Cuddy was on his six week tour of Eastern Europe. (Yes, behind the iron curtain! Who knows, maybe he was a double agent or a communist? Not really, he is considered a saint and was alive and pastor emeritus the entire time I was pastor at St. Joseph from 2004 until 2016. He died of a broken heart that I was no longer pastor in 2017. About one year ago, I wrote an editorial for the NEWSLETTER with this same title. 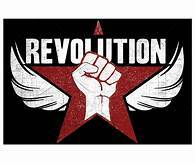 After defining "revolution" as a radical change on the outside, and an even more important and radical change on the inside, I answered the question by saying tht "The Revolution now lives--mostly dormant--in the heart and head and body and spirit of every man, woman, and child. It waits to be freed, to be called into life, to be creative, to charge up the world--but mostly, it just waits." Well, it is still waiting! Waiting? For whom, or for what? It waits only for you and me. All to often, when we think of revolution, we think of Fidel Castro and Che Guevara, of communist coups, and armed takeovers, and of bombs bursting in air. Or we think of the Weathermen and of Patty Hearst. But we never think of ourselves-as captains and lieutenants or foot soldiers in the Revolution. We do not need guns or bombs, beards, or a straggling bunch of followers to make a revolution, but we do need power-and before you say you don't have any of that either, let me correct you. Almost everyone has some power. For example, any one who has a knowledge, or a skill, or a talent that others do not have, and that can benefit both the person who has it, and the people that do not-that person has power. And the Revolution waits for people like that-waits for them to share that power, waits for those who do not have it to receive it-even to demand it when it is not forthcoming. What do I mean? Simply, I mean that every "professional" person has power, whether he be a lawyer, a teacher, a doctor or a priest, a plumber, an auto mechanic, or a TV repairman. These people, and many others besides, have power, and the lay people in their fields do not. Some of these professionals lord their power over others, others share it. Some move the Revolution, some make it wait. Some use their positions and status as pedestals for looking down on others, for making others feel inferior to them. O, how easily can the professional, through his attitude, the technical language he uses, the very fact he makes me wait, convey to the lay person that he is inferior-because he can't fix his own sink or his car or his liver or his mind or his soul. Rather than putting me into contact with my world, myself, and enabling me to better live in my world, I find myself even more alienated. Some people use their power to make me feel small; others empower me to live as well and fully as i can by sharing their power with me. In the one case, my body, or car, or whatever is a foreigner that I need an interpret or for, but the interpreter never helps me to learn to speak my body's or my car's language. In the other case, my body or my car becomes a friend, a part of me; I am at home with me, and with what is mine. This transfer of power is not an easy thing, and that is why it is revolutionary. Perhaps that is why the transfer of power usually costs a great deal-a great deal of money, or of struggling, or even of humility. Yes, the Revolution requires among other things great humility. I have to be able to admit I need help. The professional must be humble enough to stand without his power. I am an individual, a person. I need to be humble enough, and assertive enough to announce that. The professional must be humble enough to recognize and accept that in me-and in himself. The only real revolutions are the revolutions in our hearts-revolutions that move us toward a radical recognition of our humanity-and that move us toward a radical recognition of every other individual person's humanity-revolutions that move us to love what we see. Mao and Che, Buddha and Moses, Jesus would have been so happy to have accomplished that sort of revolution even in th heart of a single person. It waits....for you.....and for me. When I reread this article with Revolution capitalize, it brought back so many repressed memories of my Summer of 1978, the anxiety I had with this kind of post-Vatican II dribble. Is this the role model for me when I get ordained. And so many people ate up every word he spoke and wrote, many of them still living today in Macon. I always had unease about Macon and returning to Macon, an undiagnosable anxiety about the place even for the entire 12 years there as the pastor. And now I know why. I have the diagnosis and it is this kind of theology in the letter and the homilies this priest gave while Fr. Cuddy was behind the Iron Curtain. And his homilies were about four or five during Mass, at the introductory rite, before the readings, at the homily, before the offertory and after Holy Communion!! I kid you not! Now you know why I am so sickened by the return of the 1970's today! I diagnosed my problem! You will find this interesting. A group of lay Catholics dis-invited an abortion drooler legislator in New York (Democrat) from participating in the St. Patrick's Day parade. Tragic that our bishops don't have the guts to do this. Certain catholic priests who vote Dem should also be dis-invited. Well, Father, you know they say that posession is 9/10 of the law. That might explain his behavior. Fr. McD, the kind of thing that happened to you, the realization of why you were uncomfortable, I usually call grace. When I have one of these sorts of moments where I realize, sometimes many years after, what exactly was going on during some past event, and I am somehow freed with the realization, I think it's the Holy Spirit giving me a little epiphany, a little light, a little grace. It is refreshing to the soul. I'm glad you have a copy of that little newsletter. Because maybe if you'd just sort of remembered the article, it would probably be fuzzy. But now you have hard evidence of how the Gospel was hijacked, how the Church was hijacked, and how chaos reigned, and how something deep inside you found it agitating and concerning. And I'll just bet, if anyone had called the Diocesan Office to complain about that newsletter, their complaint would have hit the circular file. And that is why we are in the mess we are in today. How meaningful is that ideology for me, my Catholicism, spirituality, psychology and way of life? Not meaningful at all. It is just another worldly political endeavor and as far as I'm concerned, a big waste of time. I'm convinced this "revolution" seemed exciting and new and a breakthrough because none of the Baby Boomers wanted to do the hard work of spiritual growth as it was directed down through the ages: that is, facing their own concupiscence in all it's ugly manifestations and living all of their lives fighting it to gain virtue and holiness. They didn't want to (and still don't want to) remove the plank from their own eye, so they could see rightly. Nope. Much easier and more fun to remove point out the splinter in the other guy's eye, and make it out to be huge. Macon in July---like Augusta, Columbus, Columbia SC and other cities on the "Fall Line' (where the Piedmont meets the Coastal Plain),---must have been built on Hell. May have been last year Macon hit 100 degrees in September! I hope the coastal breezes of Richmond Hill provide more relief than the Ocmulgee River does in Macon! "Patrick Moore often misrepresents himself in the media as an environmental “expert” or even an “environmentalist,” while offering anti-environmental opinions on a wide range of issues and taking a distinctly anti-environmental stance. He also exploits long-gone ties with Greenpeace to sell himself as a speaker and pro-corporate spokesperson, usually taking positions that Greenpeace opposes." "Patrick Moore frequently portrays himself as a founder or co-founder of Greenpeace, and many news outlets have repeated this characterization. Although Mr. Moore played a significant role in Greenpeace Canada for several years, he did not found Greenpeace. Phil Cotes, Irving Stowe, and Jim Bohlen founded Greenpeace in 1970. Patrick Moore applied for a berth on the Phyllis Cormack in March, 1971 after the organization had already been in existence for a year. A copy of his application letter and Greenpeace’s response are available here (PDF)." Moore is also the person who argued for the safety of Monsanto's Roundup, saying in an interview with French filmmaker Paul Moreira that he (Moore) would drink a quart of glyphosate and it would not hurt him. The interviewer then handed Moore a glass of glyphosate and challenged him to drink it. He declined, but said "I know it wouldn't hurt me." Challenged again to drink o e glass of glyphosate, Moore, replied, "No, I'm not an idiot." Mao and Che? I doubt Jesus would be very happy about the revolutionary actions of those bloody murderers. Anonymous 2, help me out! I thought Patrick Moore was a popular astronomer and endearingly eccentric TV personality. No, you are not missing something, John, I had exactly the same thought on reading this thread. There is only one Sir Patrick Moore—and we know who he is, don’t we? Will the real Patrick Moore please stand up? Being an Astronomy and sci-fi fanatic in my youth, I loved The Sky at Night and indeed I actually took an additional and self-directed O-level in Astronomy using Patrick Moore’s then just published book entitled—wait for it—“Astronomy for O-level.” In those days I was the first pupil at my school to do such a thing and I ended up teaching my sixth form tutor who knew very little about the subject. The O-level examination also required staying up several nights to complete a book of practical observations for submission to the GCE people (which my tutor returned to me several years later). Got an A in the O-level too. Oh those were the days! By the way, half a century later I still have Patrick Moore’s book, my book of observations, and my telescope!